Since 2007 a resident of the southern French department of the Aude-Pyrénées, Anneke Koremans is not only a tour guide in Cathar Country, France, but also a writer (under the nom de plume of Jeanne D'Août), photographer, historical researcher and producer (PanOccitania Media). Already at a young age, Anneke enjoyed studying the lost history of civilization, the first centuries of Christianity, the Gnosis and Mysticism, and travelled to many destinations in Europe and the Near East; especially in the 1990s, when she visited Greece, Turkey, Israel, Egypt, Cyprus and Italy to study the ancient civilizations. With her esoteric adventure novels, which were published worldwide in English, Anneke has already drawn many people to these amazing places and their mysteries. She has been a guest on many radio shows in Australia and the US, but also on a live TV Talk Show in Las Vegas in 2013. In 2012 she was interviewed for a now world famous TV documentary called "Himmler and the Holy Grail", giving her a page on IMDb. She has also worked together with the well-known American filmmaker Frank LaLoggia, writing a synopsis for a possible screenplay for her first book "White Lie ~ The Quest for The Forbidden Relic", which is available together with its sequel, "The Eye of Ra", on Amazon (see www.jeannedaout.com for all the direct links). In the Summer of 2015, Anneke (under her pen name) became a member of the ITW (International Thriller Writers Organization). In 2016, both "The Forbidden Relic" and its sequel "The Eye of Ra" were also published on Kindle eBook. Her new book, the third book of her trilogy, is expected in 2020. The storyline will take the reader to the antique world of the ancient Mediterranean Celts and Greece. In the past eight years, Anneke had the honour of being the private guide for several VIPs and celebs from around the world. Destinations: Cathar Country & Greece! From the Spring of 2019 onwards, Anneke will not only be available to be the local guide for your group tours in Cathar Country, France; she will also be able to facilitate your group tours in Greece, creating custum made tours to your wishes, tours that will be unique, as through Barinca Travel & Tourism you will discover Greece in a different way. Greece is more than just a lovely holiday destination in Europe; it is an important historical area where Hermetic Teachings and Gnostic Teachings were taught and discussed, and where the ancient Philosophers created their monumental legacy to the world. 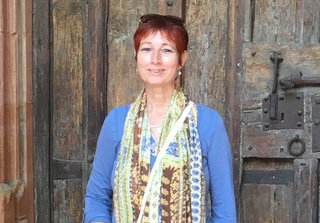 Anneke will be your guide and tour manager in Greece - working together with an experienced Greek travel agent - to help bring the antique world, the Hermetic Teachings and the ancient realm of Gaia back to life.